Orange juice is a popular beverage made from oranges. Orange juice is a good source of vitamin C (ascorbic acid), potassium, thiamine, Phosphorus G, folic acid (Vitamin B9) and vitamin B6. The vitamin C in turn aids the body's absorption of iron. Research shows orange juice is more nutrient dense than many commonly consumed 100 percent fruit juices, such as apple, grape, pineapple and prune. Citrus juices also contain flavonoids that are believed to have beneficial health effects. Orange juice containing pulp seems to be more nutritious than no-pulp varieties due to the flavonoids contained in the pulp. Due to the citric acid, orange juice typically has a pH of 3.5. Drinking or sipping orange juice can therefore cause erosion of the tooth enamel, otherwise known as 'acid erosion'. 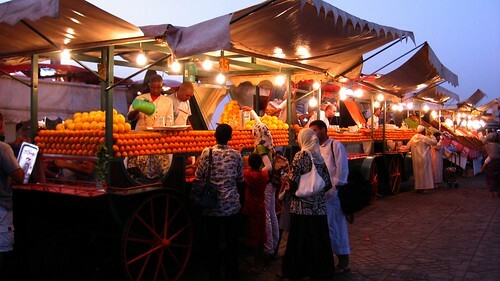 Fresh orange juice stalls, Place Djemaa el Fna.